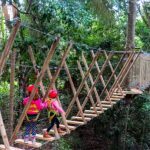 THE Gold Coast-Scenic Rim is now home to Australia’s largest adventure Park built specifically for juniors, aged three to seven, with the official opening of TreeTop Challenge’s latest attraction at Mount Tambourine. The adventure park is being officially opened today by the Minister for Tourism Industry Development Kate Jones joining the managers of TreeTop Challenge, Queensland’s premier and award-winning adventuretourism company. 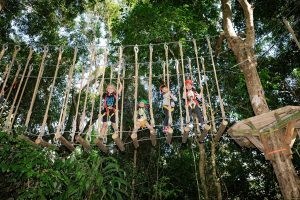 TreeTop Challenge General Manager David Taylor said the new course is both the largest junior adventure park in the nation, and the first in Queensland. The Adventure Park includes four courses, comprised of 50 challenges from ground level to a height of eight metres, which can be completed over two hours. “It’s a great opportunity for kids to experience nature while extending themselves within our Adventure Park in the trees,” Mr Taylor said. “We understand children can be wary of heights, so they can complete a lower level course and build their confidence, ready for greater adventure in our higher courses. “We operate to the highest safety standards and the children are continuously attached to overhead guidewires from their harness and are only disconnected when they are safely on the ground. Minister Jones said the TreeTop Challenge would provide a great outdoor activity for local children and families, along with interstate and international visitors. “The junior adventure park will provide families hours of entertainment and encourage children to get out and be active,” Ms Jones said. Eric Thring, aged 3, is one of the lucky youngsters to try out the junior adventure park ahead of the launch. His mum, Maria Thring is thrilled to have a healthy and active recreation opportunity for her children. “There aren’t any other outdoor, adventure options for younger children like this. It’s great for children to have an challenging, active, outdoors experience and I can relax knowing that it is completely safe. Eric loved the experience and would go every day if he could,” Ms Thring said.